It seems to me that many parts of the world are having very hot, dry summers, and Andalucia is no exception. We have had several spells of extremely hot days, the hottest of which has just ended. Don’t get me wrong – I do know you have to expect hot summers in southern Spain! I usually cope quite well with hot days, and much prefer them to chilly winter days. Almost always, that is. The past few days have been so incredibly hot that even I felt the need to complain. To everyone! Even on our mountain, which usually benefits from a cooling breeze, it was well over 40 degrees Centigrade. 40 degrees C is 104 F, so even my American readers will think that’s hot, I believe! One day, it was 42 here (107F), so goodness knows what it was like in the village. It was all compounded by the fact that it was a bit hazy and overcast, most unlike an Andalucian summer day! I really complained too early though, because I heard from a friend in Seville that it was 51C there – that’s a whopping 123F, and most buildings aren’t air-conditioned, either. She was so brave that day, still getting out in it to take people around on tapas tours (who can eat when it’s that hot!?). What fortitude. The local feria was held in Yunquera over the weekend – and do you think the Spaniards stopped partying just because of sweltering temperatures? No way! Every day I could hear the band start up, the singers start to sing, and could imagine the couples dancing the night away (who can dance when it’s that hot!?). What courage! For one weekend, the village forgot all about the ‘crisis’ and just got on with having a good time. Categories: Daily life, Fiestas and village life, Pontificating | Tags: Andalusia, Seville, Yunquera, Yunquera life | Permalink. One of the great things about our vegetable glut is that we can return to one of our favourite Spanish breakfasts. We dream about this all winter, and once the glut is here, we eat this until we’re sick of the sight of tomatoes! No jam or butter for us. No way. 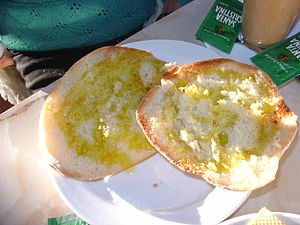 Fresh mollete, toasted (one of the great breads of Andalucia). Olive oil (Yunquera Gold – natch!). Chopped garlic. Sliced tomato. Both fresh from the garden. Salt and pepper. That’s it. Drizzle the olive oil on the toasted mollete. Top with some of the chopped garlic, and sliced tomato. Sprinkle with salt and pepper to taste. Categories: Daily life, Gardening, Recipes | Tags: Andalusia, Casa Tyr, Mollete, olive oil, Yunquera Gold | Permalink.